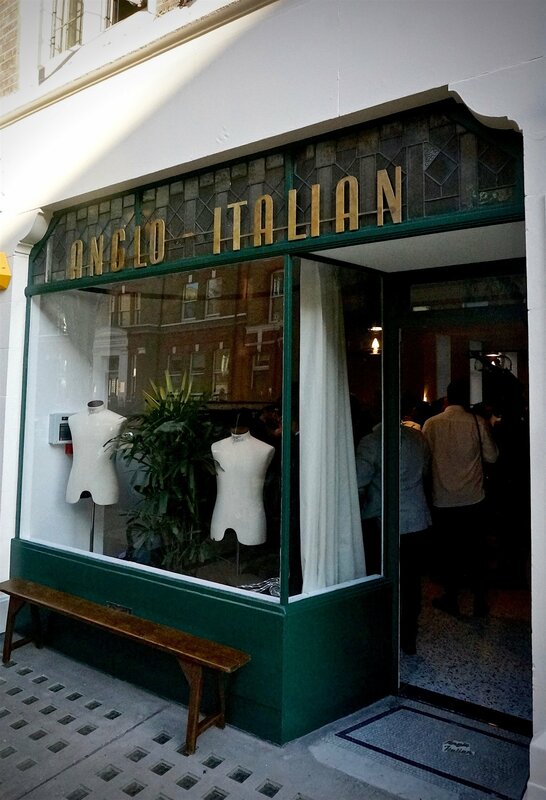 Last night was the (soft) opening of Anglo-Italian, the new shop in London being run by ex-Armoury buddies Jake Grantham and Alex Pirounis. It’s been a long time coming. Various events have slowed things down, and even last night the mirrors were going up a few minutes before everyone arrived. The shop will officially open to the public in June. But this was a first chance for friends and family to get a look at what Jake and Alex have put together. The focus - in the charming shop off Marylebone High Street - is Italian tailoring and things to wear with it. The jackets and suits are all made in Naples, with soft shoulders and a tiny hint of rope in the shoulder. They have a 3-roll-2 button configuration, patch pockets, and a generous lapel. There is lots of handwork: hand-fixed collar, hand-sewn buttonholes, hand-attached lining, and most usefully of all, a hand-padded lapel (though not chest). All have a full, floating canvas. 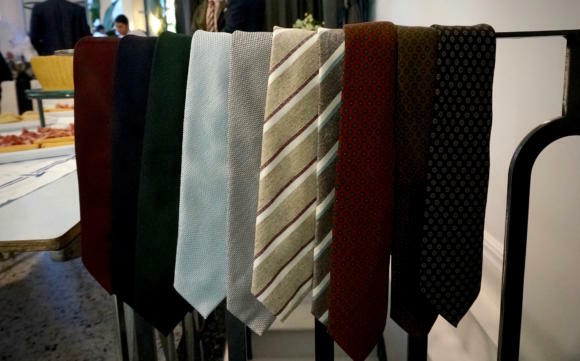 The plan is to offer a lot of made-to-measure tailoring, with try-on samples of the various sizes - and here there will be two styles of shoulder, one roped and one Neapolitan-style shirtsleeve. The price is good given the amount of handwork: around £990 for a jacket, £1300 for a suit, with a small uplift for made to measure. The two themes of tailoring and customisation extend into the casual clothing. The stand-out piece here is a suede bomber jacket, available ready-to-wear in tan and dark brown. Cut in an aviator style similar to the Valstar, its distinctive feature is a high collar of ribbing that can be flipped up or down - the latter being warmed and having a lot more swagger. These will be available made to order in seven different suedes, zip or button front, with simple changes to the pattern like body length and sleeve length. There is also a navy-nylon field jacket, to wear over the tailoring, a range of odd trousers, to wear with the bombers or the tailoring, and a selection of crewneck knitwear. Throughout, the aesthetic is relaxed and muted. The jackets are in faded checks and the trousers come in soft browns and greens; the ties and scarves too are muted and versatile. As Jake puts it, “like chucking talcum powder over the normal bright colours of summer”. This aesthetic carries across into the jeans - perhaps the most interesting category of the lot. Made in Kyoto, they have a relatively high rise and a subtle taper. Unusually, Jake and Alex were able to experiment with their own washes - and that is the emphasis here, with just one fit but three current washes, and more to come. As much as I love raw denim, and would pretty much always prefer it, you can never get the same colours as the lightest fades here. And they are useful, particularly in the summer. The shop is still work in progress. The shirts haven’t come in from Germany yet, the basement isn’t done, and nothing has been completely styled out as Jake and Alex will want. But Anglo-Italian already has a nice vibe: a 1930s Italian feel that can be seen in the signage, the decoration and (last night) the catering of the wonderful Bar Termini. It is fantastic to have another independent menswear store in London, doing well-considered, quality clothing, that is highly wearable and relevant to a modern man. I wish Jake and Alex all the best, and look forward to seeing the shop develop. You can follow the discussion on Anglo-Italian: Jake Grantham and Alex Pirounis open in London by entering your email address in the box below. You will then receive an email every time a new comment is added. These will also contain a link to a page where you can stop the alerts, and remove all of your related data from the site. Jake and Alex have very good taste. They stand out among other iGents due to their understated style. But shirts made in Germany? That’s really odd. Made in Naples, just stuck in Germany with shipping! I really wish this guys all the best. 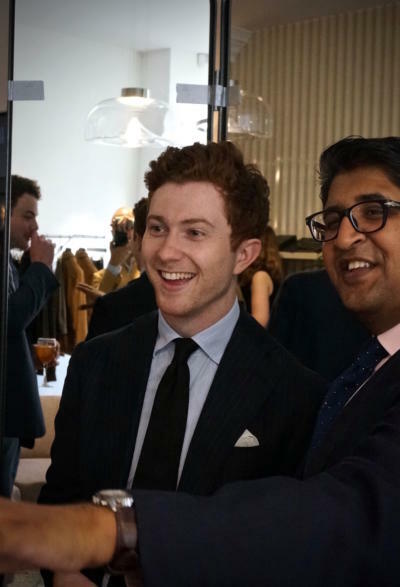 With so much comment on a large brands dominating the high street I’m delighted that there are people like Jake prepared to take on the challenge. An excellent choice of location making Marylebone High Street and go to location for beautiful menswear. I adore the signage and cannot wait for June. Very quick off the mark there, Simon. I would have expected a more comprehensive review once the shop had been fully completed. Hopefully, the Anglo-Italian products will be befitting of Jake and Alex’s youth. You’ll get that too. And ninety per cent of the product for this season is there, so pretty complete already. Thanks, though I am a little perplexed as to why there is a review of a shop which hasn’t even opened yet. Must be a first. Are there plans for a “Permanent Style LIVE” function on the website? There has been quite a lot of anticipation as to the shop’s opening, and questions about what it will contain – indeed, a reader asked in the comments only last week when I was going to publish any details about it. Simon, is your full review of your P Johnson jacket and trousers coming? Does favourably mean better? What would you say is better or worse? Does one have more styling choices or better fit for MTM? Do you know which factories P Jonson and Anglo Italian make from? Thank you for your time. It’s hard to be comprehensive at this stage given I haven’t fully reviewed either. Do you know if they will have a web shop? Very interested in the made to measure suede jacket proposition – just what I’ve been after. Do you know the approximate price of the suede jacket, MTM, off the top of your head SImon? How would you rate the quality of the suede? On a par with RL purple label, or Stoffa – or a bit below that? Bombers were 850 I think, will double check the MTM price. 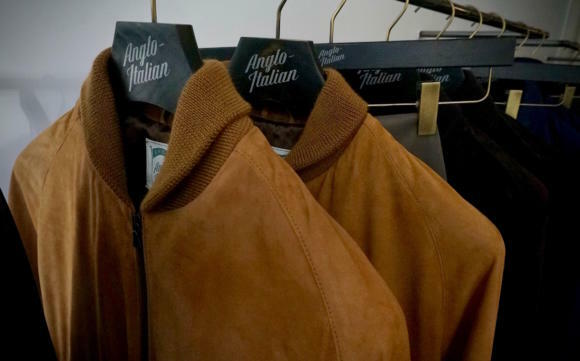 Adding to the comment regarding the suede bombers- Simon, when are you planning to write about your Stoffa suede jacket? Would be interested to read…. I’m waiting to fit it with Agyesh next Friday, then I will post. Simon, how does the handwork on the suits and overall quality compare with Sartoria Formosa? Curious to know because Formosa seems the only other Naples house that offers hand-padded lapels in RTW and the pricing seems equivalent. Thanks! But hwo actually produce gacca and pantalone for them in Naples? I’ll check they are happy to say. If I know Jake Grantham — and I do — Anglo-Italian will be one of the best shops around. Best congrats to him and Alex Pirounis! Thanks for this report! These are really good news! Slowly but steadily, London is bound to reverse the tide. And from that perspective too, one can be confident! Very exciting things are going to happen in this city again! A question: have they planned to sell shoes too? Best wishes to Jake and Alex! A very interesting job indeed! Any addition of quality menswear shops such as this one is to be celebrated of course. Many thanks for the article. In regards to the prices of jackets and suits: How would you decide between this kind of high quality neapolitan tailoring and more affordable bespoke such a Graham Browne? While the former may have far more hand operations and a better construction, wouldn’t the latter, being bespoke, offer a better fit? Generally, yes. That would be a difficult comparison and would depend on how much you rated the different benefits of bespoke and handwork. In that particular case, though, I’d suggest style would be as important as anything, given they are pretty different. 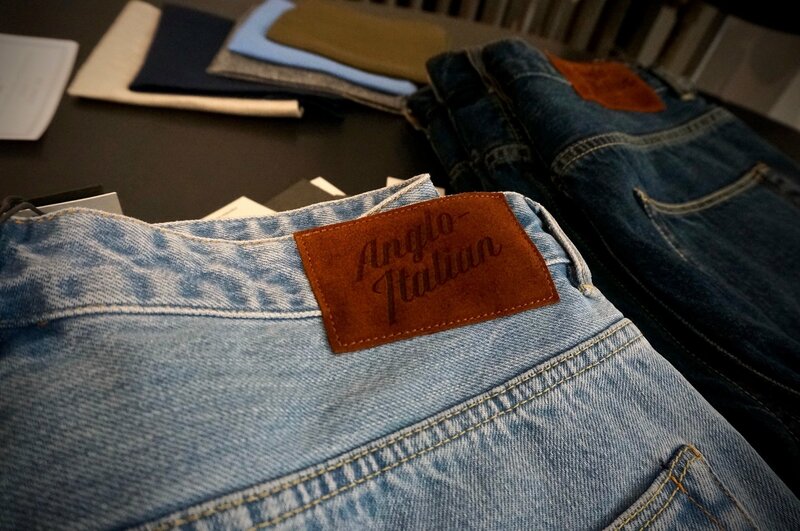 Comparing Anglo-Italian to Neapolitan bespoke would bring up the benefits of bespoke more clearly. I know these 2 guys at Armoury in HongKong, didn’t know they start their own business together until now. Wish you all the best and success , a new high end men’s wear store in Europe ! I have always wondered (and doubted) about the real advantages of a hand made chest padding, same question for hand made lapel padding. As you mentioned it in this article, could you elaborate (or refer to a previous article dealing with it). A hand-padded chest is the most fundamental craft element of a bespoke suit. Apart from the cutting/fitting side, you can chuck out all other aspects of a bespoke jacket and just keep this one. It is the foundation. A hand-padded chest makes the jacket three-dimensional. It gives it curve and roll, it builds in fullness – it shapes the jacket and carves it, where elsewhere you can only drape. Hand-padded lapels have arguably less benefit. I can elaborate more elsewhere but I’m not sure there is a post that goes into more detail. Hi Simon, do you think a hand-padded chest can benefit a RTW garment as well? I have a Formosa RTW sport coat (where the chest is padded by hand I believe) and the swell at the chest is just lovely. It looks good and feels good. Not sure if the same thing can be achieved by just adding drape. Also, I’ve always thought that a floating canvas can only be achieved by hand padding the chest piece. Could you explain the difference? Thank you very much! Yes, hand padding will make a difference, whether RTW or bespoke. That’s very clear. Thank you Simon! Simon, could you provide a phone number or web link; I’m very interested in the suede jacket. I currently own two (different styles, different vendors). I love the roll knit collar idea, having never seen that style presentation before. Thank you. The website with all details should be launching next week. hi Simon, are the jackets made in Napoli from a factory or or a Neapolitan sartoria? Any idea if so who makes for them as it would give an idea of make and style since their is such variation between the neopolitan makers? No real sartoria makes ready-made garments – it’s a factory but a small one with a small and higher end operation within it. Also, knowing where they are made would not have any affect on the make or style. Any operation large enough to make decent volume of RTW can also make to different styles and cuts – otherwise their clientele would be pretty limited. Again, very different to a bespoke maker. Best to wait for images of the jackets themselves to get an idea of style, or of course visit them. fair points. thanks for the info Simon. 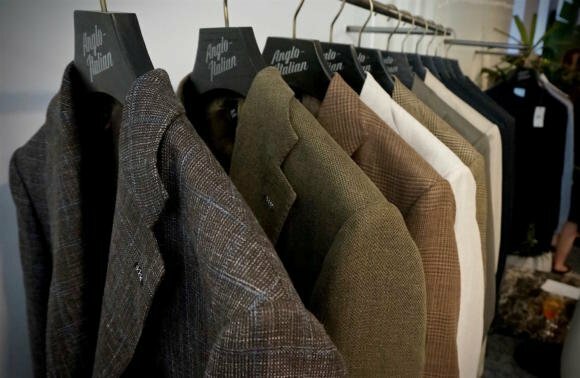 did you manage to try on any of the tailored jackets? are they similar to any of the big Italian names, I usually find Italian RTW is too boxy (e.g. Canali) or is short and tight (e.g. Isaia). If the jackets are a little roped in the shoulder will that make them a little more formal and less suitable for wearing with more casual trousers/jeans than the shirt sleeve/Neapolitan-style? How would you compare their suits versus Trunk Clothiers? I’m considering going for either Trunks MTM option or Anglo Italian. I visited AI during a recent trip to London. I really liked the style and fit of their trousers so I comissioned one pair. It is a beautiful worsted MTM trouser, with a special colour ( kind of green, cream…hard to define). I am looking forward to receiving them. Do You know how their Chinos are compared to Chinos from drakes and incotex?. No, sorry. I have yet to try them. Thank you for such a great new you tell. 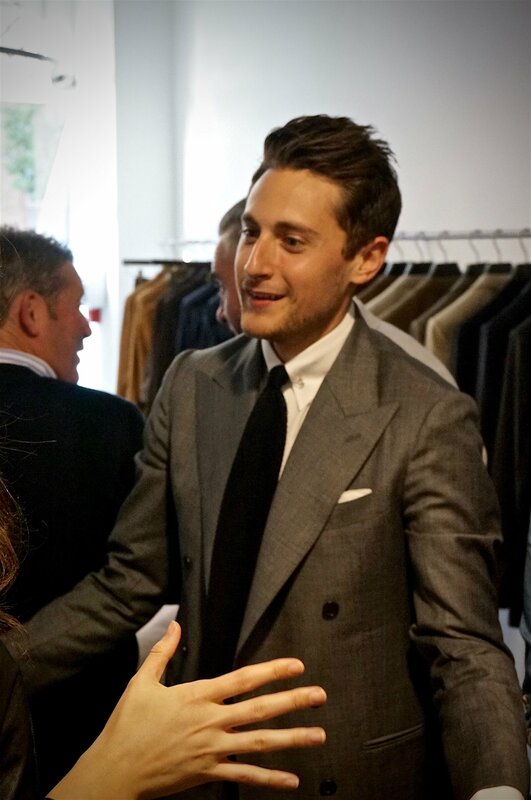 In terms of Anglo Italian, you said that Tailoring jacket and shirts is made by italy, especially Naples. Would you let me know which brand or factory is making? I cannot predict this shirts and jackets’s quailty of name? I don’t think it’s particularly relevant, to be honest. It can be misleading with any brand – as the customer assumes being made in a particular factory means a particular quality of make, when it often doesn’t. Plus brands move, as I know Anglo Italian have. And finally, the make isn’t really the prime sell with Anglo-Italian for me – it’s the cut and the style, which Jake and Alex could take anywhere. I fully understand and agree with your critical review, and some particular factories or manufactures cannot fairly decide to reveal quality of clothing. Of course, I’ve believed that Alex and Jake is ones of the tremendously professional directors in contemporary classic scene since The Armoury HK, which place I visited and bought some. Absolutely and totally I will buy their finest products. It is already shown that their style is fabulous. However, in terms of pattern or cut, it is quite different idea from your review. I think that pattern or cutting methods depend on a raft of factories have, respectively. Making clothing, especially tailored-made, is needed to get the number of shoulders, chest and bottom of ratio for pattern of composition, so that shape of jacket would be made differently. It is certainly true that Stile ratino, for instance, and Lardini are quite different shape. More importantly, It is a broadly fact that Belvest’s products and Hermes are also different shape, despite belvest provided to their products hermes ordered, even details, yet Belvest is quite one of the finest tailloring made suit brands in the world. What I mean is that the factories have characteristic ratio of pattern. It will be considered that directors can develop or give the data on proportional accuracy. Most directors keep up with or find out the brand they would like to make, so that I am curious where they order. I would like to ask about your professional review how to analyze Anglo American. I am very pleased about your mention. Places like Stile Latino and Lardini make different shapes, but they are also selling as brands – which is why those shapes are defined for their retail, but not necessarily for different customers. The fact that the factory is not that important on cut and shape is demonstrated by Drake’s moving factories in recent years, yet the cut still being very recognisable, and Anglo-Italian themselves moving in some areas. I’m considering a MTM jacket and deciding between Anglo-Italian and drakes. Do you have any tips on how they compare? I would very much be interested in a review of Anglo-Italian MTM! Where else would you advise for MTM ? I am currently looking at getting a suit for the first time in MTM and am checking places like AI and SamanAmel. Do you have any other recommendations?